This is a comprehensive guide to the many alternative and complementary therapies used in the treatment of cancer. The book helps the reader understand cancer and the importance of the immune system in defending against this dreadful disease. Part of any good cancer therapy is to understand the cause and then remedy it by changing lifestyle, improving diet, avoiding carcinogens, and developing a good mindset. Evidence is presented on how the mind plays an important role in the causation and treatment of cancer, and that cancer is caused by microbes that are pleomorphic (changing shape). Chapters include: Cancer 101; Immunology; The Cause of Cancer; The Mind and Cancer; Herbal and Natural Cancer Remedies; Metabolic Therapies for Cancer; Innovative Cancer Therapies; Wholistic Therapy for Cancer; Types of Cancer; Making a Decision About Cancer Therapy; more. Packed with charts, lists and discussion on all sorts of alternative and innovative cancer therapies and research. 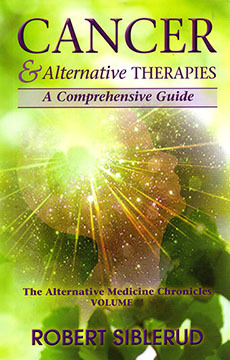 CANCER & ALTERNATIVE THERAPIES: A Comprehensive Guide By Robert Siblerud. 314 pages. 5x9 Paperback. References. Index.